Made it to Normandy Farms, often rated the #1 RV resort/campground in the nation. First impressions are very positive. We are here for a week and will trek to Salem, Boston, Plymouth and Newport, RI. Lots to see, lots to do. Looking forward to the North End Italian District in Boston. Almost forgot; Cambridge, Harvard and Fenway Park! You will have to wait for pictures. Friday, 5:00 pm - raining already!! It's going to be a long weekend. PS: I'm not a Patriots fan but kinda cool to see their home. They are a great football team. We enjoyed our inaugural visit to Maine and short (expensive) trip to Nova Scotia. What I wasn't able to do is get great photos of Maine's lighthouses. Instead I give this link for lighthouses of the world: http://lighthousefans.com/index.php. Take your pick. I can't believe we will feel the effects of another near hurricane. Not much of a comment about Ted. Is the Kennedy dynasty coming to an end? Bill is gone. Nice weather follows. Going on a day trip. The CAT may be one of the most advanced in the world operating at 40 knots. Restaurants, pub, casino and theater should keep us entertained on the relatively short trip (3 hours). Maine is blueberry country. These are growing wild on low scrubby brush yielding a wonderful fruit. Pancakes anyone? Continue reading Wild blueberries of Maine. Continue reading Bar Harbor Campground. We fully anticipated enjoying the beauty of this wonderful place on the planet and were not disappointed. The coastline, islands, mountains and the sea are simply spectacular. Unfortunately, attractive locations also draw a plethora of tourists just like us. Tourism is what drives the local economy from mid-May through October. It literally shuts down other times. We will stay one more day then start our trek south arriving back in Leesburg late September/early October. Our trip north next year will certainly include Noca Scotia. Just wasn't in the cards this time for a variety of reasons not the least of which is Bill. Having been on the road and staying in RV campgrounds fpr 10 1/2 months I have one very profound observation: the number of families on camping trips. Kids, parents, friends and even grandparents are filling the summer campgrounds. Tents, popups, travel trailers, 5th wheels and motor homes. The best memories I have as a kid was going camping with my parents. It's these experiences that are somehow family binding. Good to see families being together and creating lasting memories. This is what solidifies our family values! We need more of it. Continue reading America left: lets just agree to an amiable dissolution. Departing for Bar Harbor, ME this AM. If we meet Bill during our stay we will simply batten down the hatches and ride it out. Will not get to Nova Scotia this time. Bar Harbor Campground does not take reservations. First come first served. Show up, check available sites, pick one then register. This is a little chancy but the campground came highly recommended and is the closest to the town of Bar Harbor. If we can't get in we may be in a Wal Mart parking lot overnite. Looking forward to lobsters and the Acadia National Park. The park is supposed to be awesome. I just hope Verizon has good digital coverage in the area. I need to get some work done. We leave Wells, ME Wednesday for Bar Harbor. Planned several days there with a possible excursion to Yarmouth, Nova Scotia. Unfortunately, the National Hurricane Center is forecasting Bill to arrive in Nova Scotia Saturday or Sunday. Check out the animation on the link provided. Soooooooooo .... need to develop a Plan B. Maybe their forecast is wrong. Nonetheless, the eastern seaboard is in for some strong weather. Plan B may be Montreal, Canada. The joys of being mobile! Departed Essex Junction, VT this AM. The FMCA rally was informative. I learned my coach is within the weight limits (I had it weighed) so Pam doesn't need to discard any of her shoes and I can keep my golf clubs ;-). 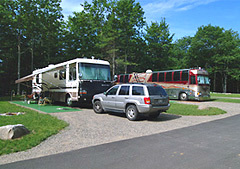 On our way to Wells, Maine and staying at Wells Beach Resort (campground) for a few days before heading to Bar Harbor. It's still unreasonably hot for this latitude. Our goal this summer was to travel north to stay out of the heat. But, as luck would have it, the heat followed us. 80 degrees is considered a HOT day in Burlington. Temperature peaked at 95 degrees the last 3 days. Records are being set? Ouch. Moving on to the coast of Maine today. Looking forward to cool sea breezes! Continue reading Live free or die. Early arrival at the North Eastern FMCA rally in Essex Junction, VT (just ourside Burlington).